During the frigid early morning of Friday, January 22, the clinking of rosary beads and ringing of bells could be heard as the participants of the TFP Student Conference attended Holy Mass. They were spiritually preparing themselves for the 37th annual March for Lifein Washington, D.C. Fortified by Holy Communion, they departed reflecting on the effects of Roe vs. Wade, the cause of over 49,551,000 lost American lives, which far surpasses the loss of life caused by every American military engagement combined. At the march, participants carried banners and the red medieval standards of the TFP, while others played in the marching band or distributed flyers defending innocent life: An Appeal for Insistence. “The abortion debate will be decided by who insists more” read one banner. University student Kyle Klufa of Oklahoma shouldered a large cross sponsored by America Needs Fatima (ANF). The cross’s surface was composed of hundreds of 1” by 1” wooden squares, each bearing the name of an ANF member who desired but could not attend the march. The life-size cross was heavy. “Even though my shoulder was sore,” said Kyle, “I wanted to carry the cross up Capitol Hill and complete the march!” TFP Student Action volunteers marched under the motherly gaze of the statue of Our Lady of Fatima. She was carried by four TFP members in ceremonial habit. As one banner so aptly stated, “Our insistence in the anti-abortion fight must be buttressed by an unshakeable confidence in God and Our Lady.” Delicious brick-oven pizza awaited conference participants as they returned to the TFP headquarters that night and enthusiastic conversation filled the air. Students payed avid attention to the series of lectures. On Saturday morning, conference attendees chanted the Nicene Creed and after a hearty breakfast assisted a series of informative lectures and study circles. Mr. Gustavo Solimeo, director of the Sedes Sapientiae Institute, explained how Catholicism and socialism are irreconcilable. Later in the day a talk on the privileged role of the Blessed Virgin Mary by Mr. Michael Drake provided great material for the study circles. A talk on the Reign of Mary, based on the writing of St. Louis de Montfort by Mr. Robert Ritchie, director of America Needs Fatima also offered hope for the future. TFP vice-president, Mr. John Horvat, rallied the young participants to actively defend Christian civilization as dedicated Catholic laymen. Other talks addressed the deepest roots of the abortion mentality and presented methods of action to oppose the Cultural Revolution. 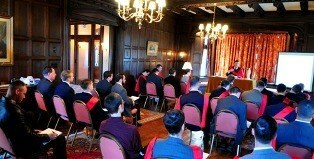 HIRH Prince Bertrand of Orleans-Braganza gave a stirring address at the conference. 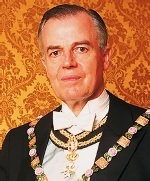 HIRH Prince Bertrand of Orleans-Braganza gave a stirring address on Sunday, encouraging all participants to be devoted to Our Lady, an essential element of Catholic militancy. After attending a beautiful sung Latin Mass at Immaculate Conception Church in York, Pennsylvania, students returned home ready to “fight the good fight” with renewed ardor and dedication.